Greetings to you, Sororitas and Fraters! As you may know, March 17th is a special date for us: Liber Day! For the occasion, the Liber Mods are preparing a little celebration for all the DIYers out there. In the run-up, you can participate in the festivities by showing us the heraldry of your factions in the 40k and 30k settings, along with some of their character. To do so, all you need to do is to present the photo of a model painted in the colours of your DIY army, along with a short text presenting that model's great deeds performed in your name. Whether you paint a new model or use one that has been in your army for decades is up to you: what's important is that their faction should have their own visual identity (ie, it is your own personal colour scheme). The accompanying text should be between 100 and 200 words long: this could recount any battles it may have participated in on the tabletop or could be an exploration of the character's life in the grim darkness of the far future; if you need, take a look at the colour plates in the Forge World books to find inspiration. To provide some pointers, I shall also post some of these up myself over the course of the challenge. Should you complete this challenge on time for March 17th, all you need to do is post your work up in the Liber Day thread, and you will earn the title of Herald of the Liber, along with an identifying signature badge to wear proudly when going out and around the Bolter and Chainsword. Good luck, the Emperor Protects, Death to the False Emperor, and most importantly: have fun! Edited by Lord Thørn, 17 March 2018 - 03:00 PM. Edited title to make clear this is an event. Always a brave fighter, Gjermund began the systematic purge of the petty champions of petty kings on Nidavellir during the settlement of the planet as a secondary fortress by the Shadow Wolves. Though his original intention was to improve the Chapter’s grasp on the world’s ruling elite, honourable duels gradually became slaughter and murders after the news of the destruction of Varadon. Where once stood a proud soldier of the Adeptus Astartes, now only remained one of the rare survivors of a dead Chapter. Emptied of all previous emotions by his losses, only anger and hatred were able to take their place. Gjermund, nicknamed the ‘Lionslayer’ by his peers for his senseless destruction of lesser foes, could only fall to the worship of the god of war and blood. Edited by Lord Thørn, 02 March 2018 - 11:52 PM. Brother Koresh has served with the Sixth Host for two decades, and has shown his worth and readiness for advancement in various battles across the Principalities and Orionis Reach. His heroics in the persecution of no less than three of the alien hexenic strains have brought his name to the attention of the Archangel Benaiah, lord of the Second Host looking to fill in the missing pieces of his squads. However, most prominent in the listing of Koresh’s many deeds is his assassination of the false savior-king. The Angels Penumbral, intolerant of variant beliefs, are prone to guide the progress of religion of their home world and often with force. Though this messianic figure was slain, his death was spun as an act of martyrdom by his followers. The cult only grew in size, before its spread was cut short by a larger taskforce of Angels. Personal note, this is the first ever model I have painted. Entirely in dry brush, at a Warhammer store that recently opened in my town. Edited by Conn Eremon, 03 March 2018 - 04:15 PM. Side note - Conn, that is a damn fine model for your first ever paint job. Good work! "When you die, tell your Gods I said 'you'll have to do better than that'." A proud member of the veteran Ninth Company of the White Hawks, Anaximander's list of campaign victories is almost as formidable as the twin Power Katars he wields. A gift from the Brotherhood of Crows, a brother Chapter of the Silver Circle, Anaximander has used these artificer-made weapons to slay the enemies of mankind with equal fury and skill for over two centuries. Although typically brash and outspoken like most White Hawks are, Anaximander also embodies the virtues of the Chapter; he is fearless, a shrewd tactician, honourable in his dealings, and a stalwart ally to his Circle-brothers. Actually taking part this time. Edited by Ace Debonair, 07 March 2018 - 07:16 PM. Besides Arcimboldo, six battle brothers remained unaccounted for after the Fourth Great Purge of the Scallop Stars. The remainder were lost in the infamous Genyx Landings, when three Chapters stood against a world of orks – and were found wanting. Arcimboldo now travels Sector Antona Australis in an unending hunt for word of his missing brethren. Pledged to the Sun King of Cepheus, his path became entangled with the World-turners; and subsequently, with Inquisitor Unfortunus Veck. Edited by Apologist, 06 March 2018 - 02:21 PM. 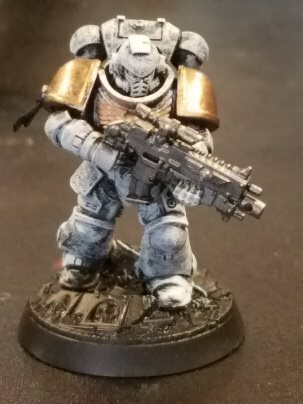 Stalwart descendants of Dorn, the Stygian Guard were clad in armour alabaster in hue and mostly devoid of ornamentation but for the Aquila upon their chests and the inset of their left pauldron, both in jet black. 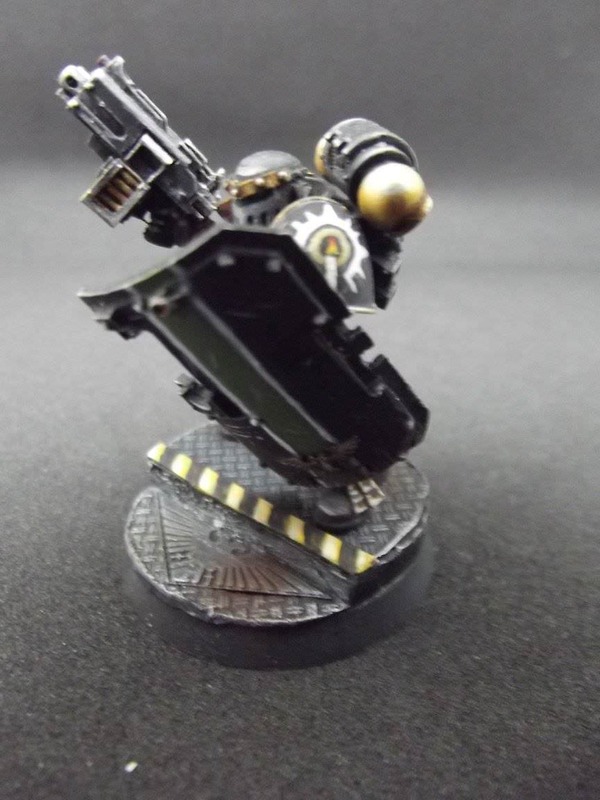 The chapter’s icon was a skull over a pair of back-to-back canted scythes (representing the chapter's willingness to combat the enemies of the Emperor both Xenos and heretic), all three elements white. The Guard was, even amongst their austere peers, an ascetic chapter forswearing all forms of ceremony and ritual but for the cleansing, focusing agony of the nerve glove. Some say it was, finding their usual methods of warfare failing against the cults of Cyprius III, chapter master Sophusar who experienced a vision while undergoing flagellation within the glove. A vision of the chapter transformed, clad in vivid hues and their tactics unbound by all constraints and logic. Other reports indicate that it was master of sanctity Angra who proposed the chapter infiltrate the enemy cults to bring them down from within, and with this began their acts of trophy taking and the imitation of the enemy. Perhaps both are true, perhaps both are but lies proliferated by their own cult: the Exalted Fecund. What is known is that the once stolid Astartes, ferrymen of the souls of the foes of Mankind to the empyrean, became reapers of souls in mad service to the Dark Prince, their icon retaining the bleached skull yet transforming to resemble the symbol of their new patron. Archive pict of `Psychopomp` warband iconography. Individual units and indeed individual marines, are known to display various patterns upon their left pauldron under the chapter’s blasted icon, seemingly as mood and whim dictates, with some others such as the Black Stallions biker squad wearing a uniform emblem upon their right pauldrons. It is rumoured that the squad took this emblem and agnomen as a challenge, a slight of sorts, to renowned loyalist biker units such as the Raven Wing and the riders of Chogoris. Cassiel Samuel is a member of the Umbral Spectres chapter of Primaris Space Marines. he has served during the Horus Heresy and is a survivor of the Battle of Calth, back then he was a heavy weapons specialist who utilised a Legion pattern heavy Bolter and was selected for the Primaris Marine Project for exemplary service within the Ultramarines he was placed into stasis with the rest of the Primaris Marines for the duration of the project. When he was re-awakened 10,000 years after he was placed within the Unnumbered Sons legion and formed a close bond with who would in a standard century become his Chapter Master. When the Umbral Spectres chapter was founded during the Breakup of the Indominus Crusade he was inducted into Umbra, his Chapter Master's inner circle mainly due to their close friendship and thus knows his Chapter Masters many secrets and has helped as a trusted advisor for campaigns where heavy weapons were more favourable in the current situation, however he has not attained a higher position in the chain-of-command by his own choice due to his own pragmatic attitude towards attaining higher ranks as he believes that he should earn a higher rank not be placed within one due to his friendship with his Chapter Master. He is currently with the rest of his Chapter in the Ultima Segmentum fighting against the Tau Empire's more recent efforts of expansion. Edited by WG101, 13 March 2018 - 07:25 AM. Can we post multiple chapters? Got a few from over the years. Luciver Heyel is a rising star within the Bright Lords, a quiet but charismatic sergeant who earned Veteran honors within the Torchbearers, the chapter's most elite boarding-action specialists. A man of little ego and great selflessness, the relatively youthful Heyel earned the respect and loyalty of the far more seasoned veterans he leads when he marched directly through a torrent of enemy plasma fire to save a downed battle-brother from heretek Skitarii - an incident that has earned him the tongue-in-cheek appellation of "Lightbringer." Edited by Seukonnen, 12 March 2018 - 10:14 PM. 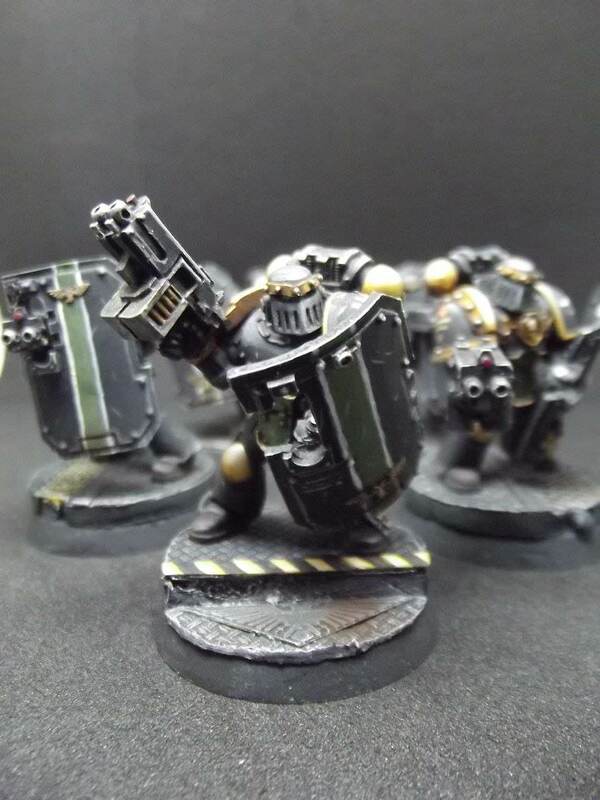 During the Tyrannic Wars upon Tasal, Brother Laxran was tasked to a Devastator squad, much to his frustration. Nevertheless, he amassed some impressive kills of his own, including the slaying of a Carnifex who had stood resolute in the face of grav-cannons and Hellfire shells. "The Penitent Engine is the final method of redemption available to those who have fallen from His grace. It is an absolution, a rededication of ones soul to Him on Earth. The Penitent Engine known as the Test is a device unlike most others. Not only does it dredge up each and every sin committed by its occupant, but it forces them to remember the sins of its previous occupants as well. The fury, the despair and the nigh upon psychopathic need to enter the fray is palpable to those who witness it. It serves as a rallying point, for no Sister would ever retreat when the Test still stands. But it also acts as a warning - Be not be wanting in your service to the God-Emperor, for eventually the Test will be waiting for you..." - From the personal notes of Canoness Saffron Sera, of the Order of the Dauntless Spirit. Edited by The Saint Ragnar, 15 March 2018 - 12:49 AM. Sweet throne of Terra, this thread is filled with magnificence. If we're allowed multiples, though, then I've got another notable that needs an honourable mention (and probably his model needs a do-over in the near future) that I'll add in as soon as I get a picture of the guy that isn't terrible. Svana Jakobusdottir Dravestanys hailed from the Northernmost Bastions, the last hive along Terra’s Northern Way to fall to the Emperor during Unification. Violent and vindictive, she grew up in poverty under the heavy heel of the highborn aristocracy, each day a fight for survival among the ruins of her people. One day, her mother was disfigured for rejecting a nobleman’s advances; fifteen-year-old Svana, who’d witnessed the whole thing, hunted the man down and fed him his own eyeballs before stabbing him over fifty times. For the murder of an Imperial official, the laughing girl was faced with the choice between a humiliating, public hanging or life-long service with the Northern Varyags, infamous for their genocidal tendencies in the Great Crusade. Svana chose the latter and after a ceremonial burial had declared her dead, they assigned her to the Varyags’ 2nd Warhost as a throatcutter responsible for upholding the regiment’s policy of “no survivors”. This new life of non-stop warfare suited her and over the next ten years she revelled in the bloodshed, eventually receiving the senior rank of Charger for her ferocity and massive kill-count. As the Varyags purged world after world for refusing Imperial Truth, Svana began to take a perverse pleasure in blasphemy and sacrilege: During the Subrikkan Subjugation in 001.M31, Charger Dravestanys got drunk on sacramental wine and proceeded to fondle statues representing the local goddesses while wearing the bloody vestments of a high priestess, random “blessings” and “absolutions” leaving her lips. The model is well done; her backstory is well-written, but worrying. Did she remain loyal to the Emperor during the Heresy, or did she turn to Khorne (as suggested when you described how "she revelled in the bloodshed") or Slaanesh (as suggested when you described how she'd "fondle statues representing the local goddesses")? Well they are back home today. Yay for unexpected blessings from the Emperor of Mankind! Thanks for concern mate. Hope to get one of each of my faction up (at least that I have painted) in the next day or so. Pict-Capt of Brother Tsuoko, pictured next to the Land Raider Excelcior Aeonic Light in the armory. Brother Tsuoko has a reputation for his stoicness in the face of enemy fire, as well as his poetic meditative prowess. Chaplain Katz has been known to borrow his poetry for services, and many of his brothers go to him for meditation. However, that which he is best known for is the willingness to sacrifice himself for his brothers or high command, and will often be a rearguard operator, holding the line long enough for others to get out. The most notable of these incidents is when he held took enough missile hits to allow for reinforcements to arrive soon after falling intoa coma due to blunt trauma. For this action he was awarded the Guardian Kama, one of the highest awards the chapter dispenses. Tsuoko is a member of my 1st tactical squad and tanked close to a full crisis squad worth of missiles (plus maybe a broadside) to protect my Librarian who ate the rest of the Tau army. Got tabled, but I did enough damage i feel that off-field reinforcements showed up to recover the bodies and the unconscious. I gave him the angel wings between the backpack and his head to honor that (he may deserve a repaint though). Sir Victus was firstborn to the noble Pentharian family on the planet Gaven. He fought valiantly in trials of expansion and a succession war on his homeworld to earn a name for himself among his peers, eventually earning the right to undertake the Ritual of Becoming. As a Knight, Sir Victus served primarily as a stout defender of his House Viscount and did not see active conflict again for many years. In 842.M41 when the upstart Waaagh! of Ork Warboss Toofkrakka assaulted the Marilith Sector Sir Victus ventured from his homeworld with the Viscount of House Sharak's honor guard on a campaign of vengeance. During one such engagement on the ice planet of Brink, the Viscounts forces became overwhelmed by the greenskin advance. Umbra Talon was damaged in the withdrawl - immobalized as the honor guard attemped a retreat through a narrow pass. Sir Victus swore to remain and cover the retreat. The Viscount was able to make it off planet and Sir Victus' was named among the honored dead. Some weeks later, when the Eclipse Marines were entrenched in pushing back the Waaagh! on Brink, they were forced to retreat into the very same pass. To their surprise they discovered Umbra Talon still engaged with the greenskins. With its position at the pass mouth, it provided shelter and covering fire for several of the House vassals and workmen cut off from the retreat as they attempted to repair the Crusader's damaged legs. The Eclipse Marines reinforced the Mechanicum's bastion and together the two forces were able to push the greenskin line back for good. News of Sir Victus' survival and Umbra Talon's role in the offensive reached House Sharak shortly after, and Sir Victus was recalled to House Sharak. Sir Victus declined. 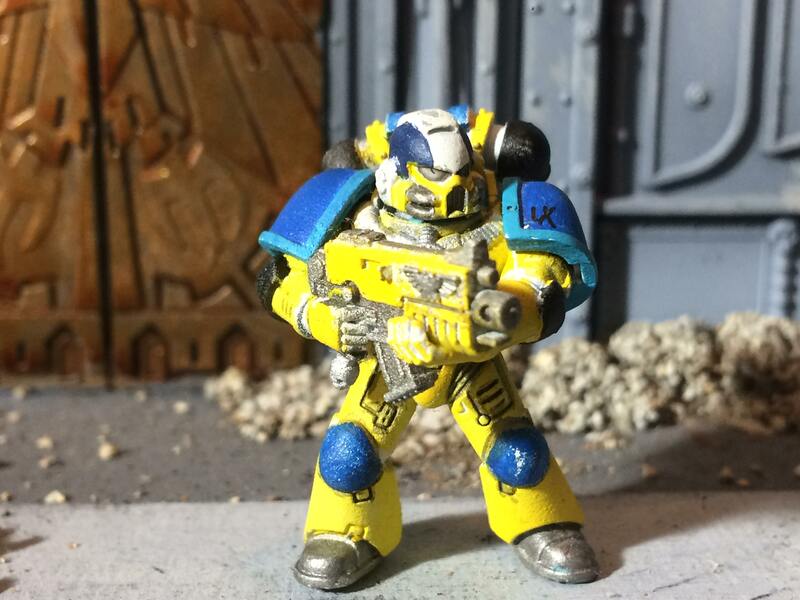 He claimed the duty of the Oathsworn - not the the Eclipse Marines, but to the Imperium as a whole, stating that the prusuit of peace in the Imperium far suprceded that of his duty to the palace. House Sharak responded by bestowing the honorary title of Lord Herald onto Victus, declaring him Freeblade with the blessings of the House. Umbra Talon has been spotted in several conflict zones since where population centers have been threatened by the encroaching chaos of the 41st millennium. 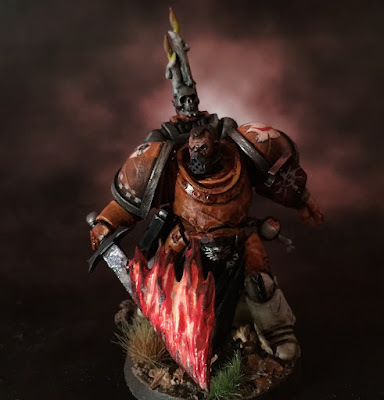 A man of few words, Kyron has served as ancient for the Iron Heralds Fifth Company since the Remalus Crusade, serving in the company command structure longer still then even the Fifth's Captain. A native born Megaran Kyron has served with quiet distinction and dedication. During his time before he held the company colours his Tactical Squad were often the anchor point of many an Iron Herald battle line, his stern unbreakable nature helping steel the nerve of his team members. It is perhaps telling that the squad he commanded still go by Tactical Squad Kyron, even though he has long since left their command. 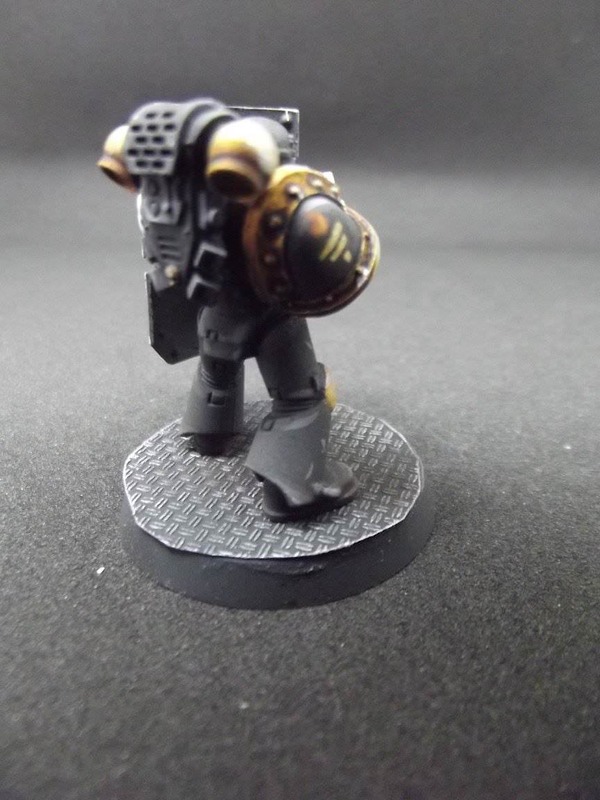 For his stoic bravery he earned both the Imperial Laurel as well as the horrific injuries that saw him permanently need a rebreather during the battle against renegades sworn to nurgle on Inserium IV. He was removed from service to recover from his wounds, so great they were. Like many Iron Heralds he consented to the use of bionic restoration, knowing full well how that would forever taint and corrupt his mind and soul due to the malific influence of the Scrap Code Malaise, the Chapter's long hidden curse. When he was able to return to duties he was given the duty of bearing the Company Colours following the massacre at Nonra Prime where the previous Ancient was slain. He served with disctinction during the Red WAAAAGH!!!! and was one of only two members of the command squad of the Fifth to survive. He personally sewed the names of every one of the Fifth that fell in the final battle onto the company standard, so great were the fifth's losses. He did it so that whilst from the front the enemy would know fear at who comes to claim them but that those fighting behind him would see the names of all those whom had already fallen and in whose name they now fought. Captain Torus gazed upon the empty field of Articus, soon to be filled with war-ravaged machines and torn bodies. The Chapter made planetfall on Medusa V and was in pursuit of the cursed xenos that dare invade one of the blessed Emperor’s planets. Torius’ enhanced vision noticed dust clouds at the horizon, the enemy was on the move. The living machine did not respond; Luthiel had been quiet since his Awakening. It was a portent, yet Torus was patient. Minutes seemed like hours as the sun started to set. Sasakiba is the latest in a long line of soldiers born to the Sasakiba family who have served in the Farbanti 765th Lightning Riders for over 15 generations. His acceptance into the initiates of the Warriors was met with celebration by his family, as he was one of the first marine recruits after the Tragedy of Sudentor. Sasakiba's service in the Tactical School of Combat has regularly sent him into the front lines of combat where he has distinguished himself holding objectives and providing the weight of fire necessary to achieve the aims and goals of the November IX. The Advanced Tactical School of Combat is sure to be in his future should he so choose, but Sasakiba seems to thrive as a frontline war fighter, supporting his squad mates and acting as linchpin to the tactical doctrines of the November Warriors.